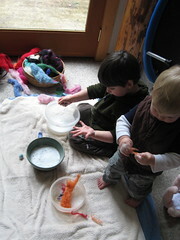 Inspired by the book The Creative Family, which I received last week, I decided to try wet felting with the boys. I already had loads of colored wool from my recent adventures in needle felting, so we got out some bowls of warm soapy water, lots of towels, and started dipping and rubbing balls of wool. Posted by Rose on Sunday, April 13th, 2008, at 9:54 am, and filed under kids' art & craft.